Storm Frank was still going through its final throes when we descended on the newly named Saddle Mountain Hostel in Invergarry for the New Year meet for what turned out to be a surprisingly settled weather weekend where we were largely sandwiched between winds to the north and rain/cloud to the south. Newcomer Steven scored an excellent memorable first meet by forgetting his boots. His mum and dad duly carted them all the way up to him in Invergarry from Edinburgh and spent NYE at a roadside somewhere in a camper van! Evening activities included a few half-hearted attempts to beat Alison at chess; three flavours of newly acquired Finnish vodka and some trip planning. Aga and James were last up the road, just in time for the bells and a bowl of crisps. We were first footed by the hostel owners who remarked at how quiet we were being. The honest truth was that most were in bed as, unlike last year, the forecast for New Year’s Day was pretty good. On Friday Fiona M, Alison, Alan and Anne, Harry, Martin and Katrina headed to Glen Shiel; Kat and Martin to bag the twin Munros of A’Chralaig and Mullach Fraoch-choire; the others to go up A’Chralaig and its Munro top. Alan waited at the car for M&K to come back down. 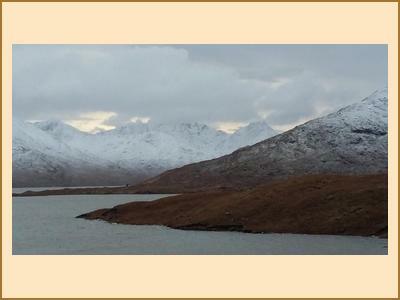 Mike, Fiona R, Antti and I went up Sgurr A’Mhaoraich through bog initially but snow up to waist deep at the summit. 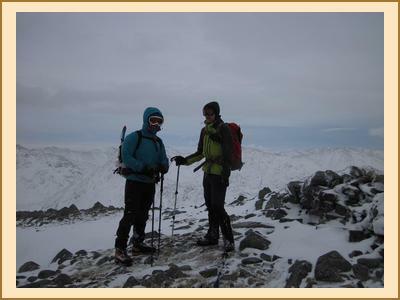 A fantastic hill, we also bagged the Munro top and descended with an interesting slippery southbound traverse. Kenny was up the two Munros next door to us, as were Aga and James. We all saw the hoardes of deer out on the hills and in the glen. Emma, Fiona C and Nigel had a good day on Carn Ghluasaid and Sgurr nan Conbhairean which they accessed along the stalkers’ path at Cluanie Inn. We could probably have seen them if we’d squinted. The four newbies went up the two Loch Lochy Munros which had gone down well. Steven was thankful for his boots; Sam was thankful for Anne Renville’s, having picked them up in error and wondering why his feet hurt a little! The evening of 1st was a jovial affair with everyone having earned their supper. All of it. It was my inaugural communal meal co-ordination effort and it mostly worked although the spuds were a little sorry (and a little late). This wasn’t a problem for EMC gannets though and two or three courses later there were some sore tums and some sleepy people! Aga’s walnut vodka went down very smoothly and some bizarrely became obsessed with taking photos of peoples’ hands. One to look out for at next New Year’s quiz I think…? The weather on Saturday was a little sketchy. Alison, Fiona M, Alan and Harry had summit envy and went up Sgurr A’Mhaoraich in significantly less snow than we’d seen yesterday. Fiona C and Nigel pushed the boat out and went up a non-denominational hillock near Fort Augustus, returning early to the hostel having found that all the coffee establishments were full of tourists/shut. Antti and I went for a longish run along the Corrieyairack pass road and saw all the deer, passing the remainder of the day with a walk along the canal and a coffee in the establishment that Nigel and Fiona must’ve missed. Anne R too had a glen day, walking along the Caledonian Canal from the locks at Fort Augustus. Mike, Fiona R and Kenny got wet on Ben Tee. Chris, Martin and Kat had a long walk to two Corbetts on the eastern side of Loch Shiel. It was a great walk until Kat called a break for lunch and realised she was missing a vital ingredient. Chris and Martin duly shared their lunch with her for fear of hangry female moments. The second communal meal went really well too and we managed to finish the remnants of the vodka. We never did manage to finish the huge pot of lentil soup that newbie Paul had brought, there being enough for a small army. Kenny’s fireworks were sadly not to be this time for fear of worrying the sheep next to the hostel. Five people opted to stay for an extra night to make the most of the Scottish bank holiday on Monday. Everyone else retreated to Edinburgh having done various things on the way home. Alan, Anne, Harry, Antti and I went up Ben Tee which was lovely until the summit ridge where windmageddon hit. Almost all the snow from the other day had completely melted. Chris and Kat did a Graham, Alison, Kenny, Emma, Mike and Fiona went up a Marilyn. Martin went shopping at the House of Bruar. A good NY meet, the facilities were excellent and I believe we may be back again very soon!